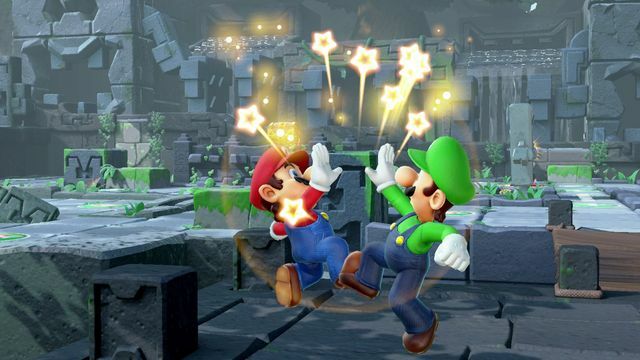 Super Mario Party is the 11th game in the main series and the first Mario party title to release on the Nintendo Switch. I’ve been a fan of the series since the first game launched on the N64 in 1999 and have played most of the others. My favourites are those that launched on the Nintendo GameCube. 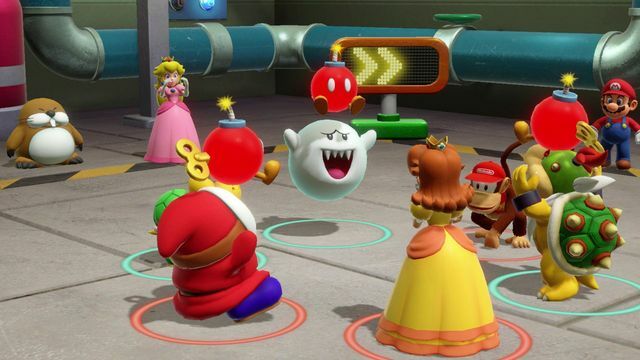 If, like me, you didn’t enjoy the previous two games for the Wii and Wii U, then you should be delighted to hear that Super Mario Party is more like the earlier GameCube titles. The dreaded car mechanic where players moved together has been removed in favour of independent movement once more. 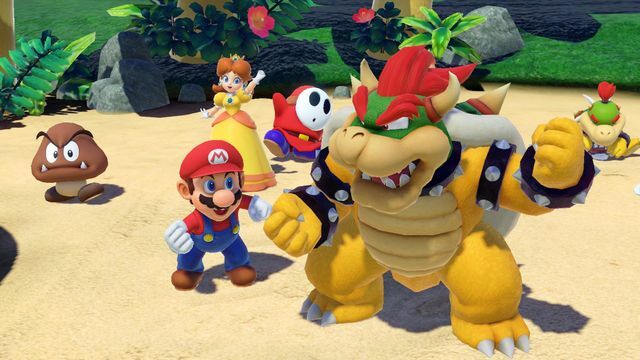 Super Mario Party features the biggest roster of playable characters yet with 20 to choose from. 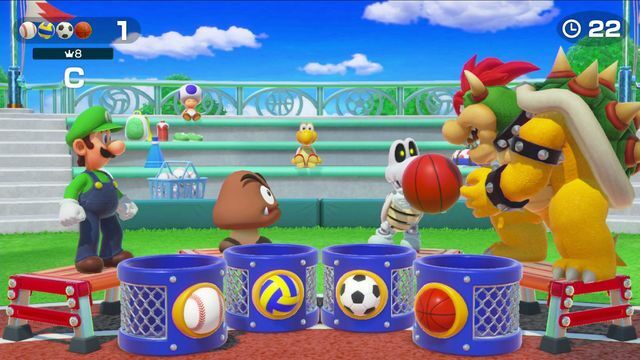 While most players will already have a favourite, the chance to play as characters such as Goomba and Monty Mole helps keep things fresh. Party Mode is the core game for up to 4 players. Here you can choose how many turns a game lasts – 10, 15 or 20 – to help tailor the length of a game. Each player rolls a dice to determine the order of play and then turns are taken to roll and move. 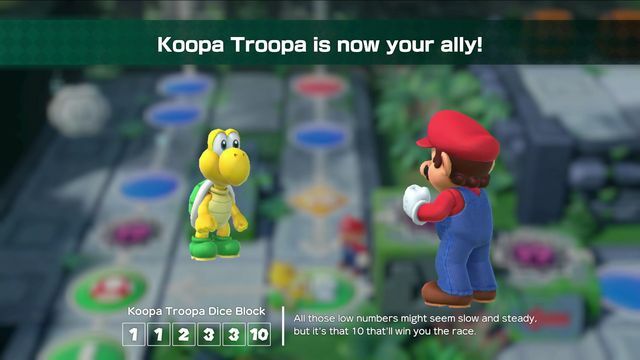 A neat new feature is the addition of custom dice for each character. You can roll a standard dice block or a custom one. Which you choose depends where you need to get on the board. 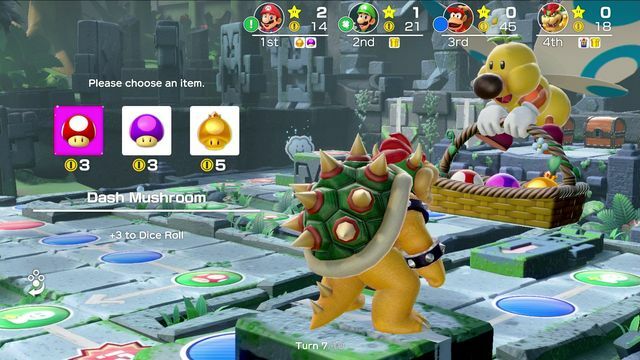 Some characters have the chance of higher rolls, some can earn or lose coins instead, while others just have a better chance of rolling a mid-range number such as a 3 or 4. 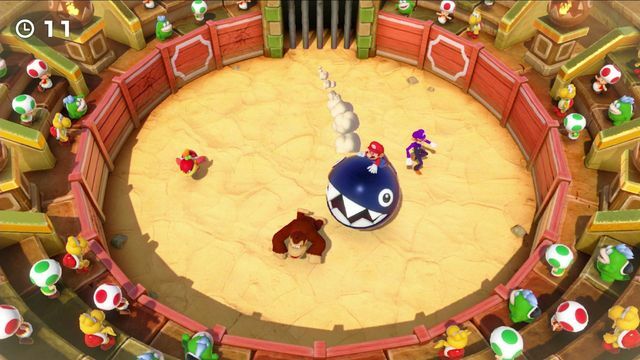 Initially there are 3 boards to choose from – Whomp’s Domino Ruins, King Bob-omb’s Powderkeg Mine and Megafruit Paradise. An extra board, Kamek’s Tantalizing Tower, can be unlocked later. After rolling you choose your path around the board. As ever the aim of the game is to earn more stars than your opponents. It can be worth staying in a short loop while you build up your stash of coins before heading off to buy a star. Luck plays a huge part which makes the game less about strategy and ability. This is an important decision that allows it to be fun for players of all ages. The minigames have always been the main reason for playing and here there’s 80 all-new minigames to tackle. Some are unlocked to begin with while others require you to discover them through playing the main game. There’s a huge variety on offer which helps prevent you constantly playing the same ones over and over. 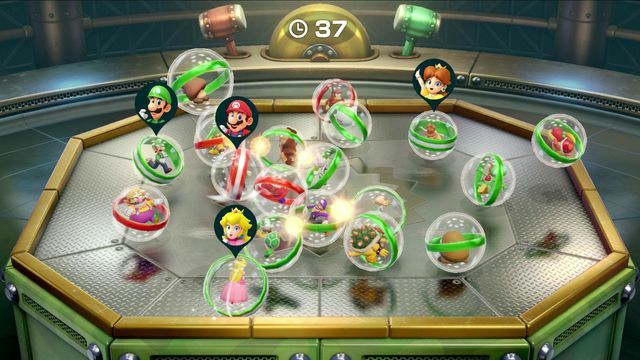 Each player uses a single Joy-Con controller and the game does a good job of communicating to you how you need to hold it for each minigame. Some are traditional stick and buttons games while others take advantage of the motion controls. Most of the games are very simple which makes it fair on younger players. Most of my favourite ones were those that required motion controls to play. A neat touch is that you can practice a game as much as you like before pressing the ready button. This helps keep things fair for new players too. 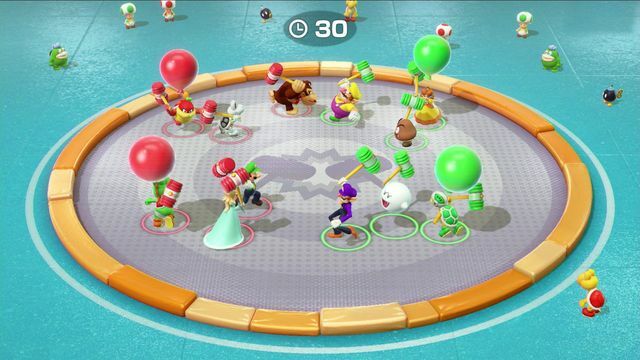 Other main modes include Partner Party and River Survival. 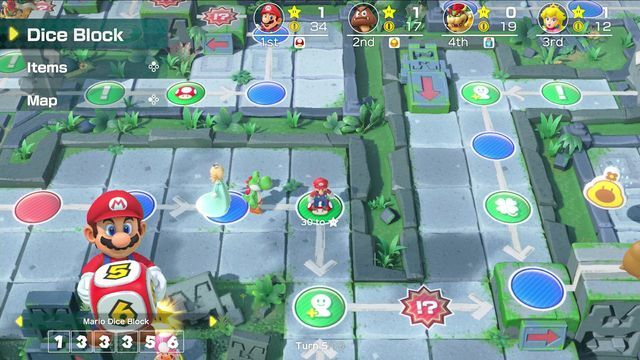 In Partner Party, players team up in pairs and the boards change to grids. 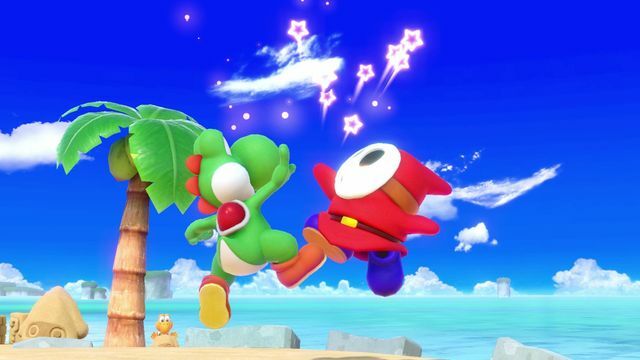 Here you share your coins, items and stars with your teammate. There’s also more opportunity for strategy as you work together to defeat the opposing team. In River Survival, players are placed together on an inflatable raft and each can paddle to influence its movement down a river. The aim is to make it to the end before your time runs out. 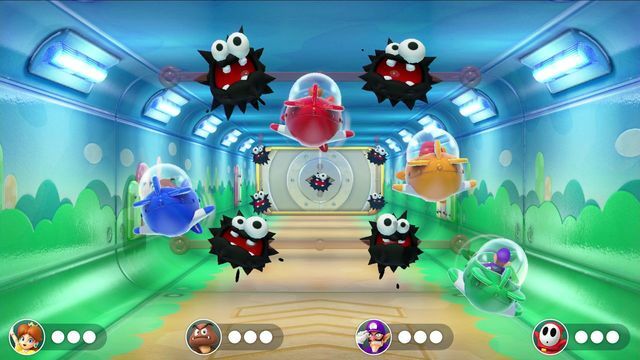 Popping balloons on the way starts a minigame where you can earn more time. Different paths down the river bring different hazards to overcome. 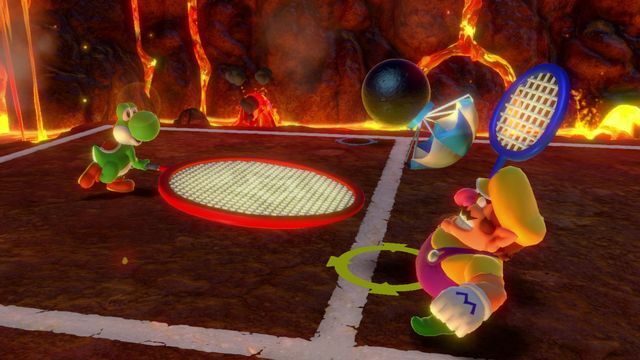 Outside of the main modes are Mariothon, Sound Stage, Challenge Road and Toad’s Rec Room. 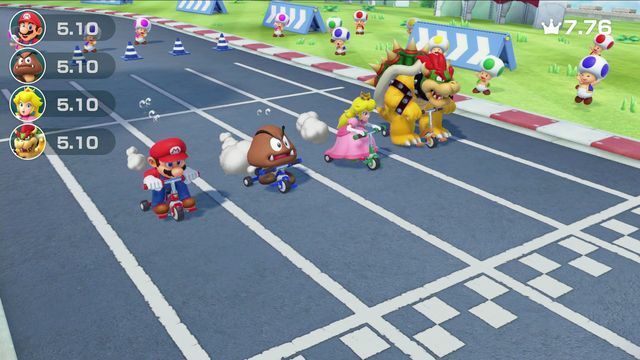 Mariothon lets players compete in a set of minigames to see who does the best, this can also be played online. Sound Stage features back-to-back rhythm-based minigames and is a lot of fun if you like those kind of games. Challenge Road is for a single player to take on challenges in minigames. Finally there’s Toad’s Rec Room which requires two Nintendo Switch consoles and two copies of the game to play some unique multi-screen games. 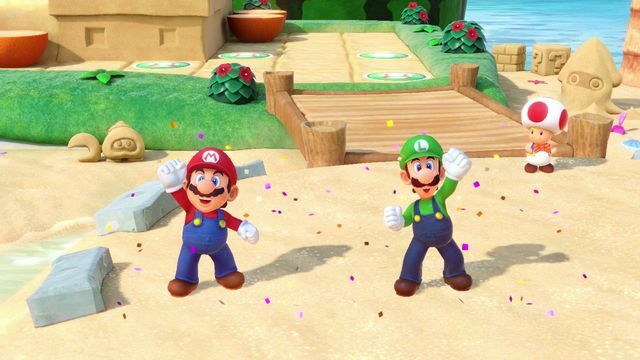 Overall I had a lot of fun with Super Mario Party and think it’s one of the best Mario Party titles to date. The switch back to independent movement and more competitive game modes really improved the experience over recent entries. Any one who is a fan of Mario Party will find hours of enjoyment here. 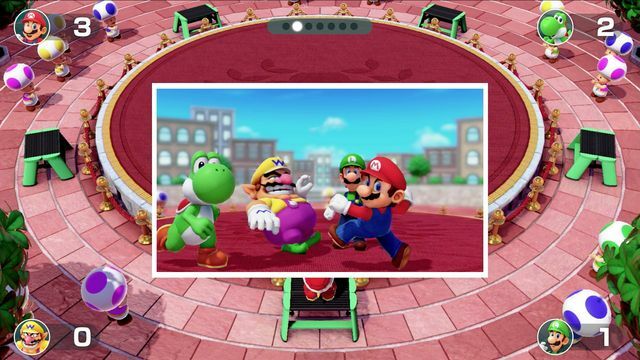 Super Mario Party was reviewed using a digital code supplied by the publisher.